Here's the thing about the "art of conversation": It goes both ways. 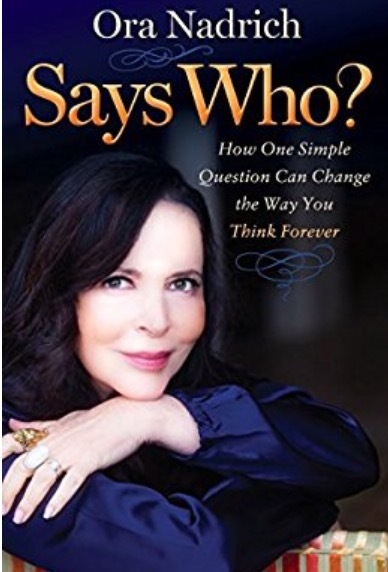 Ora Nadrich, Thought Coach, Mindfulness Teacher, Founder of The Institute For Transformational Thinking and author of "Says Who?" and "Live True"
Do you consider yourself a good listener, or are you someone who prefers to talk and have others listen to you? Some people are just natural born talkers, and others not, and if the tables were turned on the person who likes to gab, and they were forced to listen instead of talk, they might not be as comfortable listening as they are talking. The reason for that is they like to take front stage when it comes to having a conversation, which is why they do it. Have you ever heard the saying “Enough about me, let’s talk about myself?” That was meant for the over zealous conversationalist. But here’s the thing about the “art of conversation”: It goes both ways, meaning two people should share in the conversation equally, and if you’re someone who prefers being in the “dominant” position when it comes to conversing by doing most of the talking, then you’re not a mindful listener, just a good talker. It’s easy to assume that our personality type has a lot to do with how we behave, which for the most part I believe is true, but that doesn’t mean that we can’t learn to be better at something that doesn’t come naturally for us, like being a better listener. 1. Start the conversation by asking about the other person before you start talking about yourself. 2. Really listen to what they’re saying instead of jumping ahead in your mind to what you want to say. 3. Ask them questions, and not rote ones, but ones that show you’re really interested in them and what they have to say. 4.If you feel you can add to what they’re saying in a helpful way, share your thoughts, but don’t take over the conversation. 5. If you can tell that what they’re sharing is sensitive or emotional for them, you can touch their hand or arm affectionately, showing them you understand. This will make them feel more comfortable opening up. 6. If they turn the conversation onto you, ask them if there’s anything else they want to talk about. If they say “no,” it’s your turn to talk about yourself. 7. You can show your appreciation for what the other person shared with you by telling them you enjoyed it, and if it was personal information, thank them for trusting you, and assure them that you will keep it confidential. After the conversation is over, take a few seconds to feel what it was like to be the listener. Acknowledge silently that you allowed yourself to be comfortable with this role, which might be new for you. To be a mindful listener you need to truly listen, and what that means is maybe talk a little less. You’ll have plenty of opportunity to speak what’s on your mind, but by being a better listener, it will actually make you a more thoughtful speaker, taking the “art of conversation” to a whole new level. Ora Nadrich is founder and president of the Institute for Transformational Thinking and author of Live True: A Mindfulness Guide to Authenticity. A certified life coach and mindfulness teacher, she specializes in transformational thinking, self-discovery, and mentoring new coaches as they develop their careers. Contact her at theiftt.org and OraNadrich.com.